Use this Quick Start to deploy an Alfresco Content Services server cluster on the AWS Cloud. Alfresco Content Services is an Enterprise Content Management (ECM) system that is used for document and case management, project collaboration, web content publishing, and compliant records management. The flexible compute, storage, and database services that AWS offers make it an ideal platform for Alfresco Content Services. This Quick Start presents an enterprise-grade Alfresco Content Services configuration that you can adapt to virtually any scenario, and scale up, down, or out, depending on your use case. The Quick Start includes AWS CloudFormation templates that deploy Alfresco Content Services automatically into a highly available, secure AWS Cloud environment. 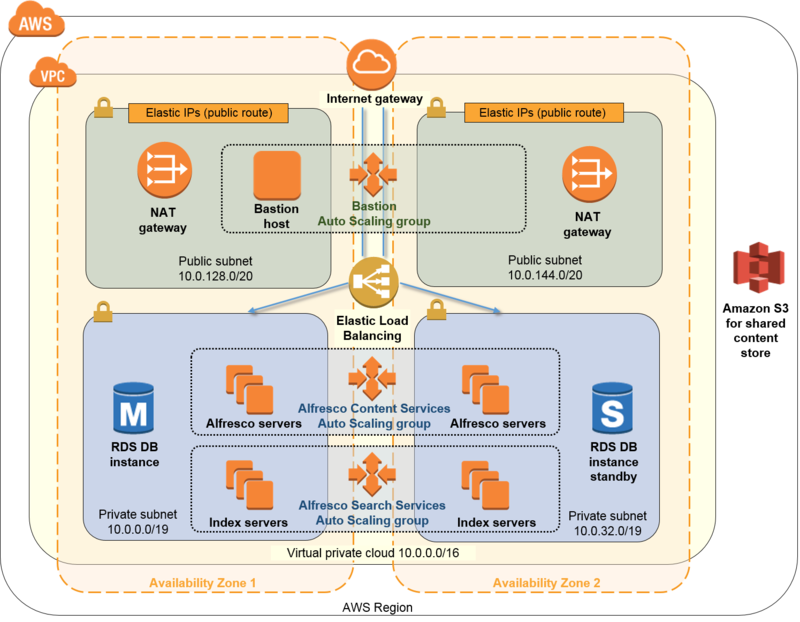 Elastic Load Balancing integrated with Auto Scaling, for load balancing across the Alfresco Content Services servers, with customizable CPU-based thresholds for scaling the instance capacity up or down. In the private subnets, Alfresco Content Services servers and Index servers. Amazon Simple Storage Service (Amazon S3) for shared file storage for the cluster. Amazon Aurora -- or Amazon Relational Database System (Amazon RDS) for MySQL in the EU (Frankfurt) Region -- as the shared database for the cluster. The database is deployed in multiple Availability Zones for high availability and automatically backed up on a schedule that you define. Subscribe to the Alfresco Content Services AMI in the AWS Marketplace. This deployment launches Alfresco Content Services 5.2 automatically into a configuration of your choice. You are responsible for acquiring a trial license from Alfresco Software or using a valid existing license if you have an active subscription. There is no additional cost for using the Quick Start, but you are responsible for the cost of the AWS services used while running this Quick Start reference deployment. In addition, this Quick Start requires a subscription to the Alfresco Content Services BYOL AMI from the AWS Marketplace, and additional pricing, terms, and conditions may apply.